Bambora Reviews: Overview, Pricing and Features. Bambora is a payment gateway built to help small and medium-sized enterprises accept and receive payments online, in-app, or within a platform in the most convenient yet secure way possible. This solution can accept payments from over 60 countries, provides you with real-time insights into your profits, and serve as a hub where you can get smart financial solutions to grow your business. This technology platform is equipped with a wide range of capabilities that let you get the most out of eCommerce and physical commerce tools in a single interface. Among its most notable features are: credit card processing, online payment form creation, recurring billing options, batch processing solutions, as well as revenue sharing functions. On top of those, Bambora also has robust fraud defense tools and risk and underwriting options in order to keep you and your customers’ data safe everytime you make a transaction. What makes this platform even better is that it blends seamlessly with any software ecosystem. It has RESTful APIs and SDKs that allow it to easily be combined with your shopping cart systems, websites, and other applications. Despite its many positive features Bambora offers a very poor customer service, which may be a dealbreaker for some. Response time is at best very slow, but we’ve had several urgent cases that needed immediate attention from Bambora’s support and our email and tickets were ignored for a very long time. This is a significant issue if you’re looking for a reliable service to handle your financial transactions. Using Bambora, you can process different types of transactions online. This way, you can easily get your money and monitor your profits in just a few clicks. Moreover, this platform has options that let you automate certain transactions, For instance, you can use the recurring billing feature to automatically send invoices to and collect payments from customers who are maintaining a subscription plan with your company. All you have to do is schedule it in the system, and you’re good to go. Providing your customers with a good shopping experience should not end with having an extensive selection of products or offering quality services. You should also make sure that it is easy for them to pay you for the products and services you give them. 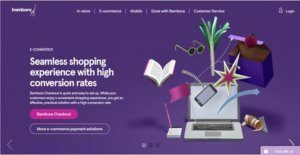 With Bambora, you no longer have to ask your customers to set up new merchant accounts that are compatible with yours. All they have to do is plug-in to the Bambora gateway. On top of that, this platform can blend with your shopping carts and invoicing systems so that transactions are faster and more fuss-free than ever. In any transaction between a business and a customer, it is important to make sure that your confidential banking information are protected. To help you secure every payment, Bambora has security tools such as fraud defense. Using these simple yet powerful tools, you are sure that any details pertaining to your transactions will be safe from prying eyes. In addition, Bambora has risk and underwriting options that let them assume all the risk for your customers’ accounts. By doing so, your business will not be liable in case your customer goes bankrupt. If you are considering Bambora it could also be sensible to examine other subcategories of Best Payment Gateway gathered in our database of SaaS software reviews. Companies have unique needs and requirements and no software solution can be ideal in such a situation. It is useless to try to find a perfect off-the-shelf software app that fulfills all your business needs. The wise thing to do would be to modify the application for your specific requirements, staff member skill levels, finances, and other elements. For these reasons, do not rush and invest in well-publicized leading solutions. Though these may be widely used, they may not be the perfect fit for your unique requirements. Do your research, check out each short-listed platform in detail, read a few Bambora reviews, contact the maker for explanations, and finally settle for the application that offers what you require. How Much Does Bambora Cost? Bambora offers two plans that are priced depending on the types of payment solutions you require for your business. The vendor also offers a range of extra payment tools which you can add to your chosen account at a certain price. We realize that when you make a decision to buy Payment Gateway it’s important not only to see how experts evaluate it in their reviews, but also to find out if the real people and companies that buy it are actually satisfied with the product. That’s why we’ve created our behavior-based Customer Satisfaction Algorithm™ that gathers customer reviews, comments and Bambora reviews across a wide range of social media sites. The data is then presented in an easy to digest form showing how many people had positive and negative experience with Bambora. With that information at hand you should be equipped to make an informed buying decision that you won’t regret. What are Bambora pricing details? What integrations are available for Bambora? They provide a pretty decent set of features to manage your payments. Transaction fees are also very affordable.